MOPAR fans and collectors will appreciate and enjoy this fine reproduction of a classic. 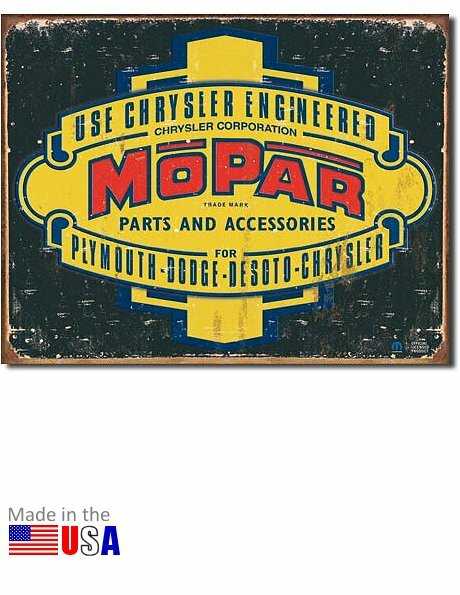 The MOPAR Parts & Accessories for Plymouth, Dodge, DeSoto, Chrysler tin metal sign is a beautiful wall sign that you'll be proud to display in your garage, office or den. This item also makes a great gift for the American automotive nostalgia collector or any classic MOPAR gearhead. This is a metal sign, made in the U.S.A. Measures 16 inches wide by 12.5 inches high. UPC: 6-05279-11314-9 | Part No. 1314. Ask a question about "MOPAR Parts & Accessories 1937-1947" Tin Sign.